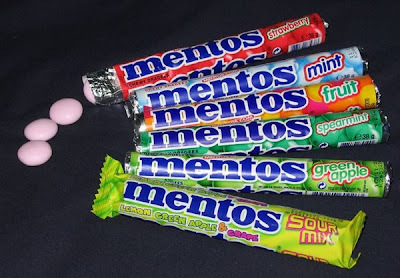 Home » Chewy » Mentos – The “Freshmaker”, or just plain borefest? I remember back in the day when Mentos hit the scene. At least, I remember in 1980 when I first tried them. However, since then, I’ve more or less ignored the inflamed birth control pill-looking sweet treat. In Target for the third time yesterday (don’t ask, Crock Pot disaster), I saw the variety pack sitting alone in the gum section. Although the picture above shows a lot of flavors, the variety pack comes with 2 fruit mixes, 2 strawberry, and 2 green apple. I bought them. What can I say, I’m the WORST impulse candy buyer I know.Last night, post-Superbowl, I decided to try them out, almost 30 years later. The consistency is weird, but not bad- a slightly crunchy outer shell, then chewiness inside. The thing that’s so jacked up about these things is the flavor profile. I had NO idea what flavor I was eating, I couldn’t even taste a hint of a real fruit. It just felt like someone had developed a bath of “fruit like flavoring”, watered it down, made a few tiny variations on it, and flavored the candies with it. Truly, it was a big disappointment.Despite a whole roll being only 140 calories (that’s 2 weight watchers points for those of you on the “reg”), they’re just not worth it. It’s odd that these continue to be made, cause I just can’t figure out who’s buying them. As for me, I have 5 1/2 rolls left. Who wants them?Bottom Line: Nope. Nothing distinct, nothing interesting, and they were created in the Netherlands. ‘Nuff said. Craptos. I’ll take all five and a half. Hint: the fun is contextual. Eat them when skiing — straight from a jacket pocket — and they’re tooth-snapping freshmakers. Eat them from your pocket in the middle of a long plane flight — having just woken from a cramped sleep with plane-food-breath — and they’re supersoft chewy freshmakers. FYI, I’ve completely changed my tune on these. I’m not sure how or why, but I love them now. I’ll do another repent review soon.